Fly fishers from across North America and around the World are invited to register for this international loch-style fly fishing competition, and to celebrate fly fishing in general. Members of the Canadian, British, and U.S. National Fly Fishing Teams and competitors from the U.K. and Europe will be on hand and competing for the team and individual titles, medals, and The NALSFFC Cup. Dates: September 19 - 23, 2017. Ceremonies Location: Logan Lake, British Columbia (45 minutes from Kamloops or 3 hours from Vancouver). Number of Competition Sessions: Five, 3-hour sessions of loch-style fly fishing. Entry fee: $300.00 per person, which includes bag lunches on all 3 days of the competition and dinner at the awards banquet/closing ceremonies. Competition Rules: FIPS-MOUCHE rules apply, with single fly rule. Special Angling Regulation: All fishing must be performed on a catch and release basis with a single fly. Maximum Number of Teams: 12 five-man teams ( 60 competitors ). BCCFFL Competition Status: 1200 point scale for the British Columbia Competitive Fly Fishing League. FFC Competition Status: Level 1.1 - 750 point scale for the Fly Fishing Canada's National Ranking Points. Location: Logan Lake, British Columbia (45 minutes from Kamloops or 3 hours from Vancouver). Entry fee: $300.00 per person, which includes lunches on all 3 days of the competition and dinner at the awards banquet/closing ceremonies. Competition Rules: FIPS-MOUCHE rules apply - all fishing on the competition lake venues must be performed with a single fly. Maximum Number of Participants: 60 competitors (12 five-man teams - with 4 spots reserved for international teams). No fishing policy: There will be a 12 day no-fishing-policy for all competition venues, which comes into effect at 6:00am on September 5, 2017. All competitors, their agents, and associates are not allowed to fish the competition venues during this period of time. Official Practice Sessions: Teams are responsible for arranging their own transportation needs and boat rental costs, as well as the access fees on the 2 private lake venues (Batstone and Corbett Lakes). - There is no maximum number of boats permitted at one time on the Tunkwa and Roche Lake venues (crowding won't be an issue). ◦ Registration for this event is now open. ◦ In order to ensure a quality experience, the maximum number of teams has been set at 12 teams. ◦ A minimum of 4 spots are reserved for international teams. ◦ Teams consist of a maximum of 5 competitors and may have a maximum of 1 Reserve Angler ( optional ). ◦ Registration will be accepted on a first come, first served basis with priority being given to complete teams of 5 competitors. ◦ Registration fees are due by August 15, 2017 (registration is not complete until payment has been received). ◦ Refunds on registration fees will not be issued for any notices of cancellation that are received after August 15, 2017. Individual registrants will be placed onto an "Individuals List" and may possibly be picked up by a team that is short on team members, or the 5 individuals will be formed into a five-man team if they agree to do so, and there's a spot available for their team. Please stay tuned for more details and updates! 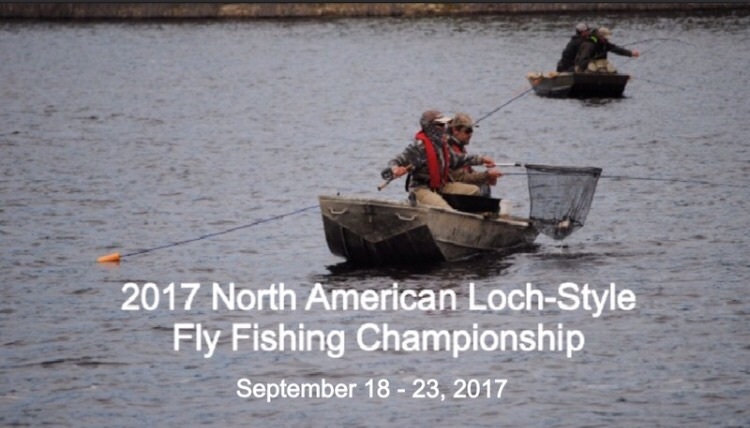 Update: I just received an email confirming that one of the U.S. National Fly Fishing Team (Team USA) will be registering for the 2017 North American Loch-Style Fly Fishing Championship. Team Freestone (an eastern U.S. fly fishing team), who has attended the past 2 North American Loch-Style Fly Fishing Championships, has also confirmed that they'll be returning. So with 2 American teams confirming that they will be registering for this event, only 2 of the 4 spots that are reserved for international teams now remain available. Registration for this event is accepted on a first come, first served basis, so please don't delay and be sure to register as an individual or team, when registration for this event officially opens at 12:00pm (Pacific Standard Time) on Monday, July 18, 2016, as the 2017 North American Loch-Style Fly Fishing Championship promises to be a sold out event! Hope they don't mind our strong beer and getting their butts wooped by a bunch of lumberjacks! Are we taking boats to Corbett and Bastone or are we using theirs? I've arranged for the groups to use Batstone's and Corbett's boats for the 5 sessions that will be held on those lakes. I will also have arranged 6 boats from Tunkwa Lake Resort for the Tunkwa South venue, so we will need to use a total of 6 competitor's boats on Leighton and 6 competitor's boats on Tunkwa North. "Team USA will recognize the 2017 North American Loch Style Fly Fishing Championships as a sanctioned event under Item 2.5 for the current point cycle. Registration opens on the 18th of July." The North American Loch-Style Fly Fishing Championship will be awarded points that are equivalent to those awarded at the America Cup International Fly Fishing Tournament, which should result in turn result in a higher level of participation by American and international competitors and teams. Just a reminder that registration for the 2017 North American Loch-Style Fly Fishing Championship opens at 12:00pm (Pacific Standard Time) on Monday, July 18, 2016. Please read the registration details and requirements that are listed above. Please note that in order to simplify and streamline the registration process and paperwork, the dinner at the awards/closing ceremonies is now included in the $300.00 registration fee for this event. Location and menu to be announced at a later date. Trout Bums are in and are looking forward to fishing with such a good bunch! Yes, that was an extremely impressive response in such a short period of time!! There's only 1 spot remaining for another international team, so don't delay if you wish to register and are 100% committed to attending this event. Additional Canadian teams are welcome to register for this event, but with registration for Canadian teams being full, the additional Canadian teams will be placed on the waiting list, and will be bumped onto the list of registered teams in the event of any cancellations. Is Eastern Canada considered International! It's definitely going to be the toughest field of competitors and the largest number of international teams, in the history of this championship! It's going to be a blast and great time for all!